On any given weekend, the residents of Australia’s second-largest city flock to the Melbourne Cricket Ground (MCG), one of the most famous sporting venues on the planet, to watch Australian rules football – comfortably the predominant sport in the state of Victoria. At full capacity the MCG holds 100,000 and is an incredible sight, particularly as the sport-mad Melbournians are a vociferous people. 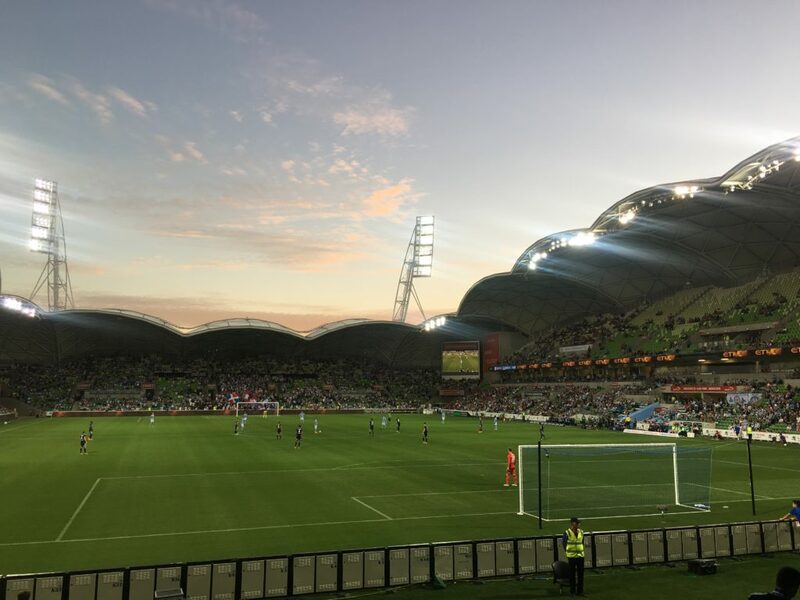 Just over a week ago, however, the city’s collective attention turned to AAMI Park, which hosted a local derby of an altogether different kind of football: Melbourne City were hosting Melbourne Victory in a crucial match in Australia’s top flight. AFL might be the favourite of the masses, but those who follow football – soccer, in these parts – love it. Any suggestion that the game might pass by in the haze of an apathetic atmosphere was eradicated within seconds of kick-off, when the VAR’s decision to disallow a Victory goal provoked a majestic rage and siege mentality of support which lasted the entire madcap 90 minutes. The A-League, perhaps reasonably, doesn’t get too much coverage in the northern hemisphere, so it’s worth noting what happened on the pitch. Victory, chasing City in the standings as the regular season draws to a close, recovered from having that early strike wiped off to deservedly take the lead. A penalty levelled matters before the star of the show – and the subject of the fans’ devotion throughout – Leroy George sealed the points for Victory in the second half. In among the goals there was a 20-man brawl, a player booked for diving as he was stretchered off injured, a pitch invader, a barrage of late City pressure, and a 96th-minute, open-goal miss on the break as Victory looked to wrap up matters. In short it was a breathless, intoxicating and engaging affair, much like any other derby in any other corner of the world. What made it so engrossing was the atmosphere. 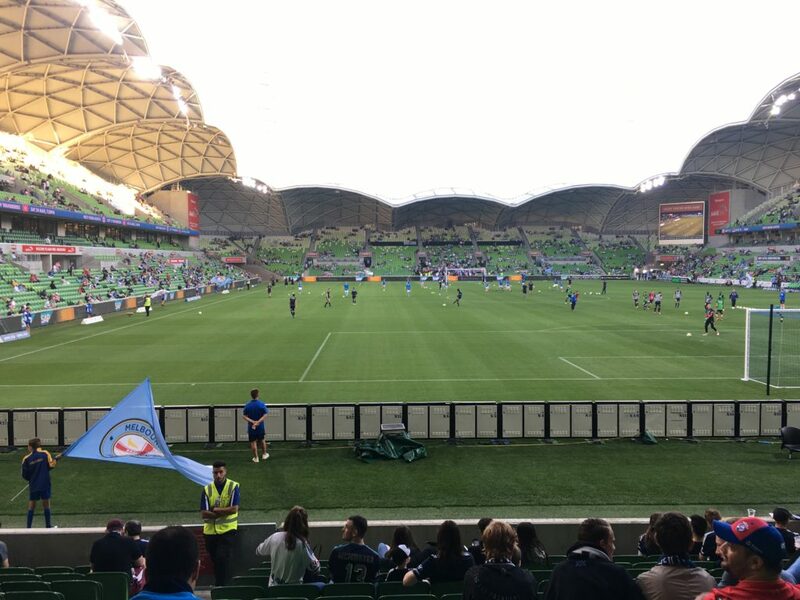 Ahead of kick-off, fans streamed towards AAMI Park from all corners. The approach is expansive, grassy and utterly sport-themed: as well as the MCG, the Olympic Park is close by, while a tennis arena and another AFL ground, Punt Road Oval, are in similar proximity. Heading to the game past stadium and park, statues and flags, there’s no choice but to feel involved in the sporting culture. It envelops the build-up, the very mindset of what is to come. 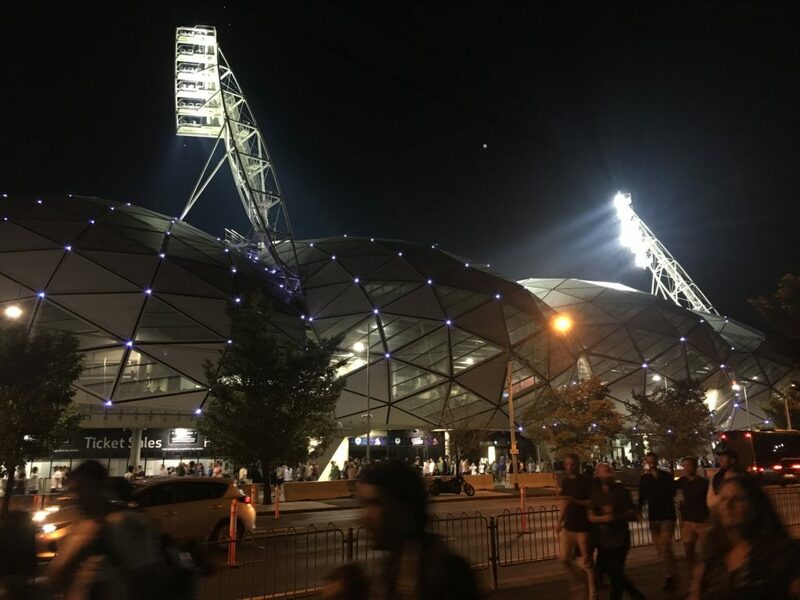 There’s no mistaking AAMI Park itself: a bulbous, iconic and unique structure, home to City and a named finalist in the 2018 International Venue of the Year award. It’s up against the likes of Manchester City’s Etihad Stadium, Seattle Sounders’ CenturyLink Field and the Optus Stadium in Perth. This was, in many ways, a typical derby day in a sports-fuelled locale, but there were some notable differences compared to the build-up of a European game. 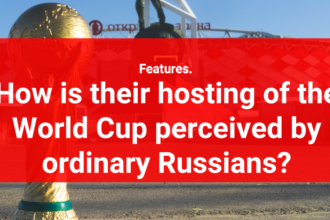 There was no real air of tension and no obvious gathering for pre-game drinks – despite this being a Friday night match – and much less fanfare over merchandise and souvenirs. Indeed, each club has a small shop built into the stadium, but there were no private vendors selling pin badges, fan-designed shirts or unofficial club products. Mercifully, there were also no opportunistic sellers of half-and-half scarves. Perhaps that’s a cultural aspect which hasn’t translated, or perhaps it’s a sign of why the A-League hasn’t quite progressed as it might have done. This sensation was best summed up by the fact that, on derby day, Victory’s own club shop had no away shirts on sale and was out of stock in several sizes of the home kit. Opportunism and engagement has to work both ways, and the commercial lead – unsavoury for some but paramount for growth and expansion – must surely come from the club and the league, not the fans. Speaking to those same supporters outside the stadium revealed a real mix of mindsets. 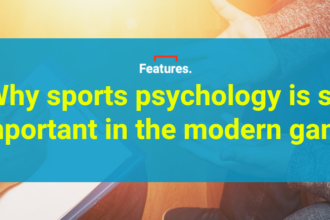 There were plenty, representing both sides of the Melbourne divide, who clearly saw the match – the sport itself, in fact – as an extension of the social calendar rather than a must-win encounter which had warranted anticipation, nerves and discussion for days in advance. It was a familiar theme and one summed up by the presence of a grandparents-and-grandchild combination who were bearing opposing jerseys: Victory for the elders, City for the youngster. They were all regular match-goers, yet utterly impassive over the question of whether the fixture caused any temporary rifts in the family. They were there for the game, not the occasion. So too, as it happened, were a large group of English men: a royal navy contingent descended on the game in happenstance, bringing with them a mix of experience from watching their own teams, which ranged from West Ham to Yeovil. That indifferent view wasn’t mirrored by everyone, of course. A group of City fans were quite happy to assure anybody listening that family members supporting Victory would be disowned. They also admitted the 2014 takeover by the City Football Group had proven to be a watershed moment; City were previously known as Melbourne Heart, but their financial struggles were significant and their on-pitch performance was low-key at best. 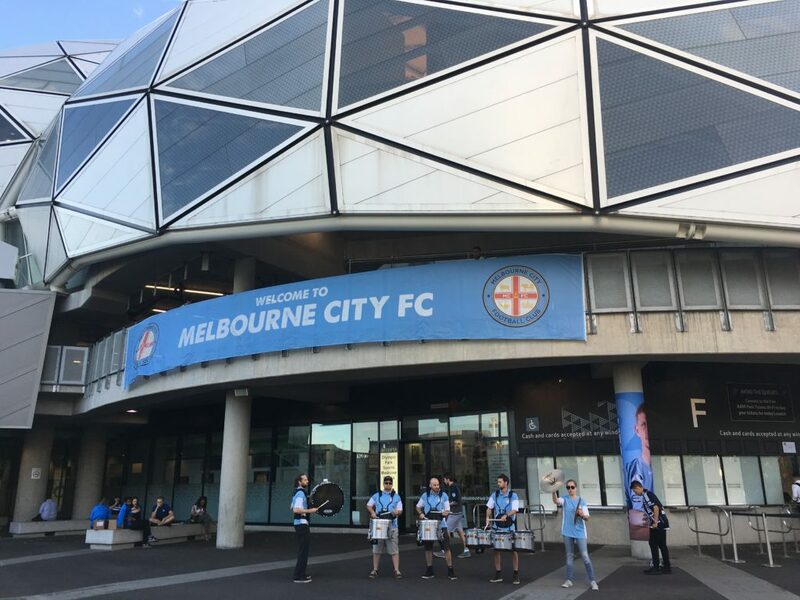 Despite early resistance – from both fans and other A-League stakeholders – Melbourne City’s fortunes have greatly improved over the past three years. They’re yet to win the Grand Final but are well placed to challenge for a third semi-final berth in four years, with the top six at the end of the regular season entering into a play-off competition. With such a mix of mindsets inside the ground, an outsider could be forgiven for thinking the match might feature a gentle, friendly, sit-back-and-enjoy atmosphere. But no. From the first whistle to the last it was in-your-face and frantic on the pitch, against a backdrop of full-blooded support from the stands. 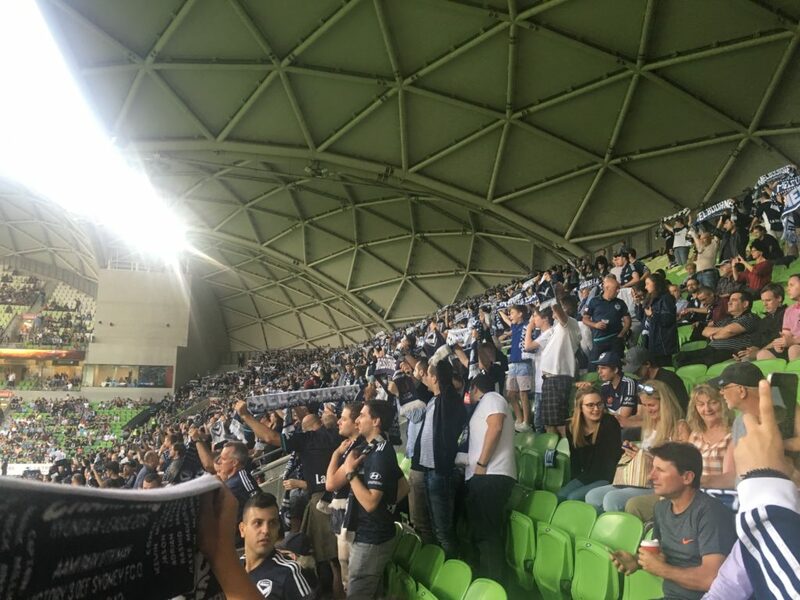 AAMI Park wasn’t exactly packed to the rafters – it holds 30,000 but the official attendance was just over 20,000 – but those who were there made themselves heard throughout. A particular standout was an oft-repeated chant from the away fans, informing their hosts that they remained as unimpressive in City blue as they previously were in Heart red – and that neither iteration was welcome in Melbourne. This was more than just football; this was derby day. Change the names and the colours and you could be anywhere in the world. Previous articleSliding Doors: What if Ronald Koeman had been sent off against England in 1993?